I'll be transferring some of the content from this site to my new blog, but I won't be deleting this site. I'll also update some pages such as my Brexion. A recording of the Is London Calling Brexit? event can now be seen below. 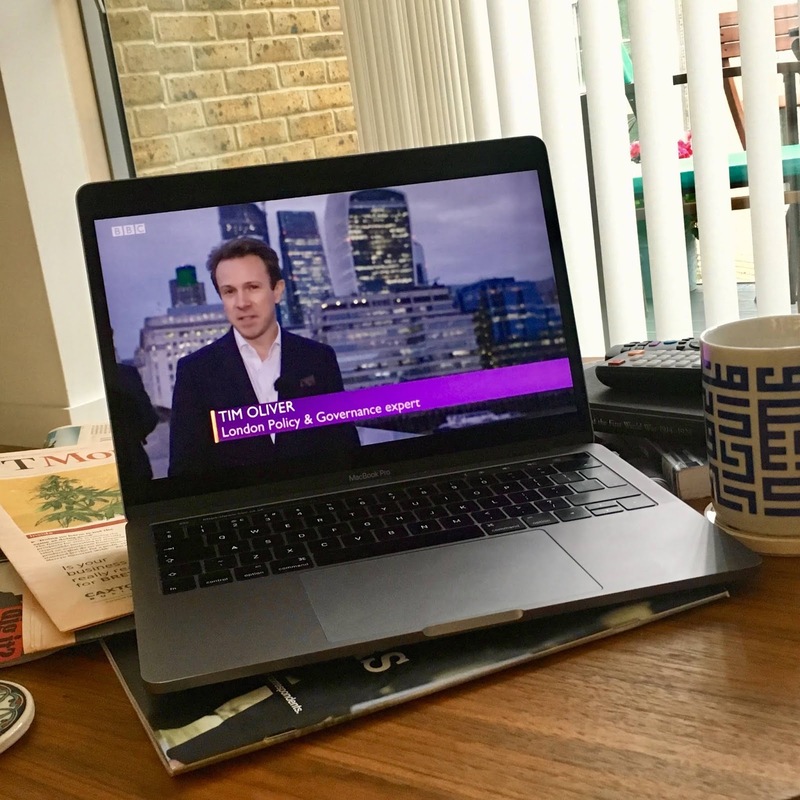 Below is a link to the short report I put together for BBC Sunday Politics London on the mental health problems facing London. You can also see the video here: https://vimeo.com/295345102 Full credit to Max McGill for putting together another great report. IS London Calling Brexit panel, 8 November. 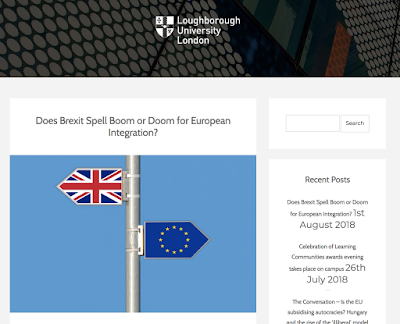 What Brexit means for London and London means for Brexit will be a crucial aspect of the UK’s withdrawal from the EU. 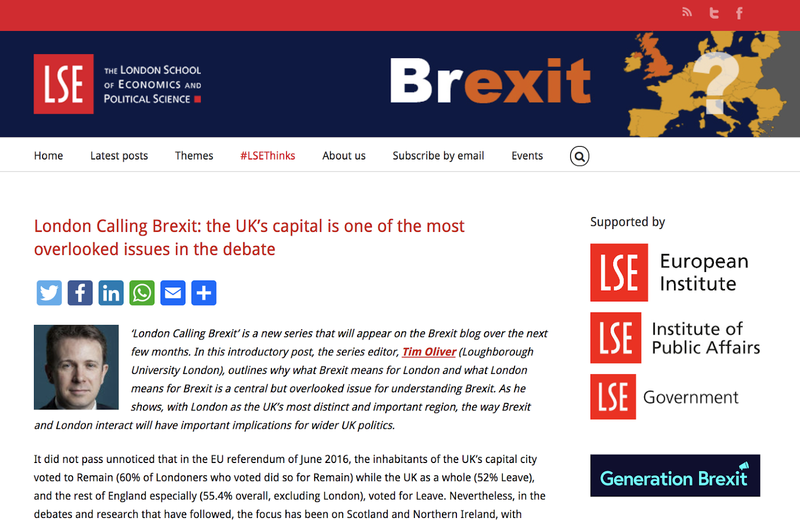 Brexit could shape the future of the City, affect the lives of millions of Londoners, and change the place of London as both the UK’s capital city and a world city. 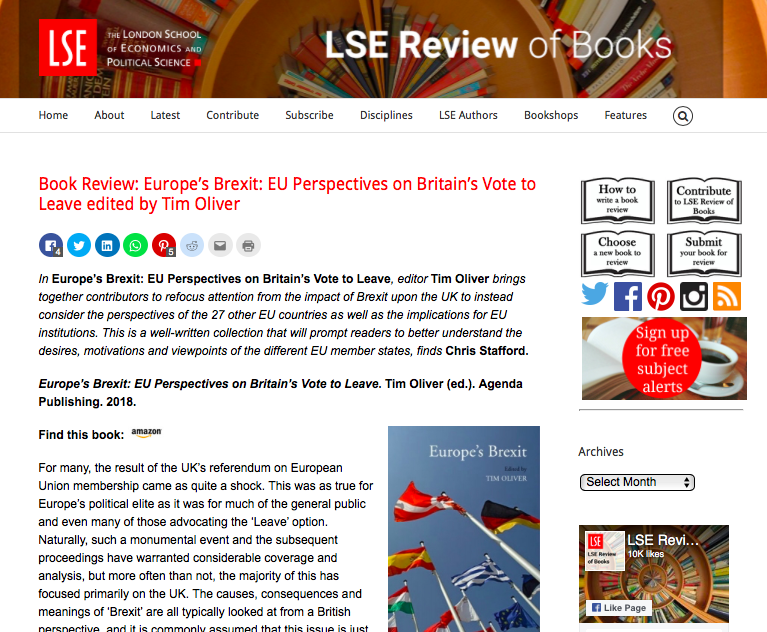 Dr Tim Oliver will launch his new book Understanding Brexit: A Concise Introduction with a panel discussion about Brexit and London. There will be a reception between 6-7.00pm, with the panel starting at 7pm. 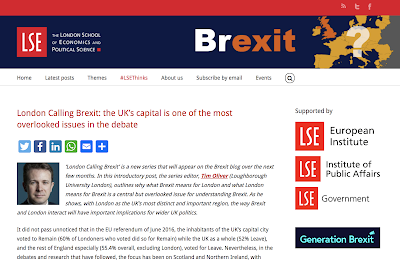 I'm editing a new series that launched today on the LSE's Brexit blog. 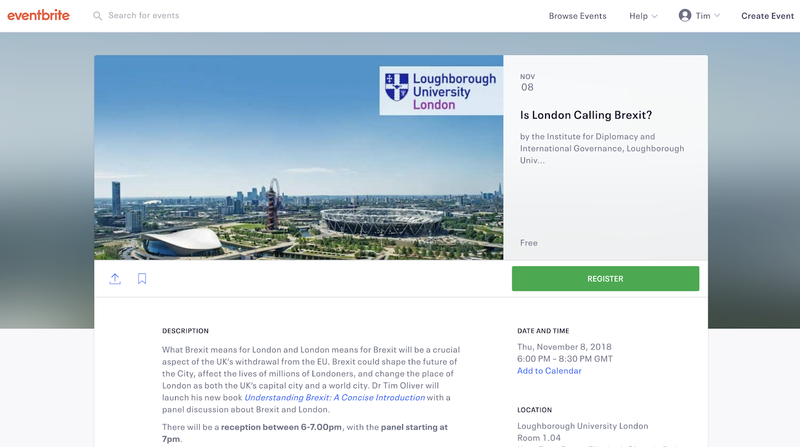 London Calling Brexit looks at what Brexit means for London and London means for Brexit. Lots more posts to follow this one on issues ranging from the city to citizens, the constitution to campaigners. I recorded a short film for BBC Sunday Politics London on mental ill health in London. I ask if London is bad for your mental health and, if so, what can be done about it. You can watch the film and studio discussion on the BBC Sunday Politics website and read a post based on the film's script on the Loughborough University London blog. 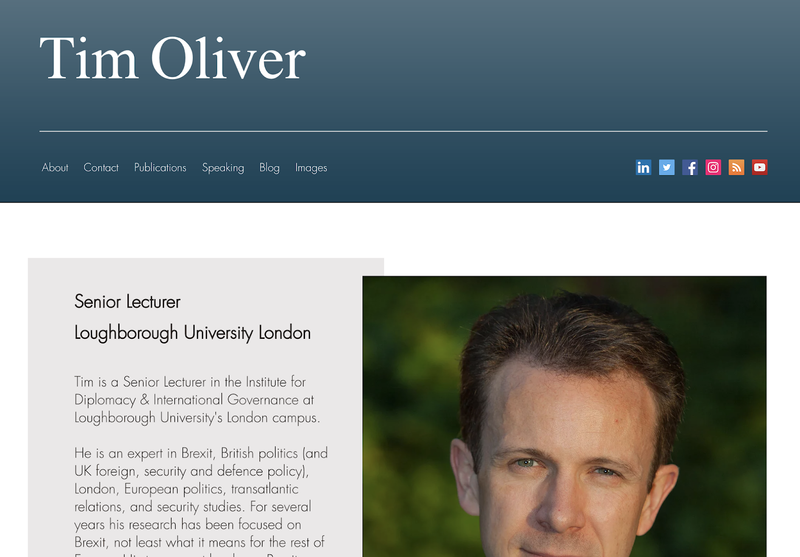 I'm not sure where my new title of 'London Policy & Governance expert' came from! I'm still a Senior Lecturer at Loughborough University London. 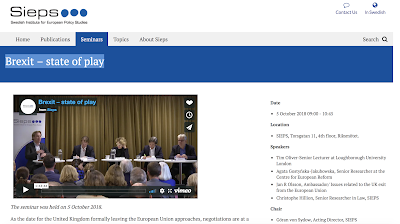 A video recording of a panel I participated in at SIEPS, the Swedish Institute for European Policy Studies, last week in Stockholm. 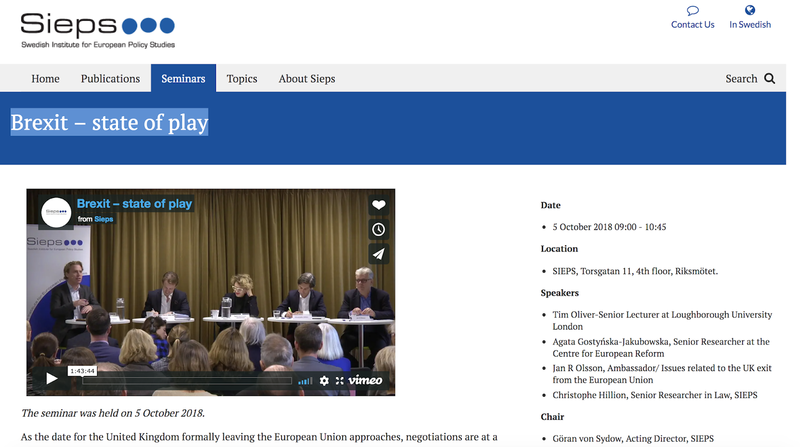 The video can be viewed on the SIEPS website. 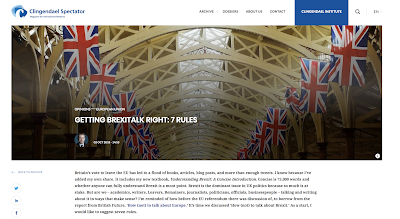 In my latest piece for the Clingendael Institute, I set out my seven rules on Getting Brexitalk Right. 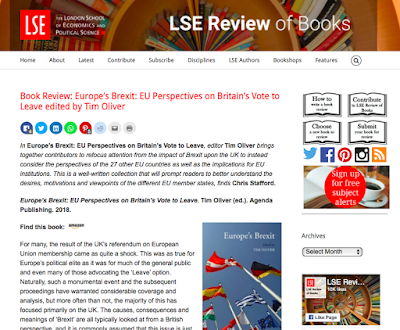 Read the full review here on the LSE's Review of Books. Multivitamins. I find they help give my body a boost to compensate for the disrupted diet and sleeping patterns. Spork. Invaluable for when you are forced to grab a meal from a supermarket or small shop. Protein bars. A good, filling and healthy option to have with you. Powerbank. Get a decent one to keep your phone alive. Book, notepad and pen. Always have something to read and write with. Headphones. Travelling without them risks a Hellish experience. Drown out the background noise of people chatting, chewing with their mouths open (a real pet hate of mine), noises from TVs or other peoples music, or, even worse, muzak. Buy some decent ones, but keep in mind you'll need to carry them around, which means stuffing them into your bag/hand luggage. Plug adapter. Goes without saying, but be sure to get a universal one. Moisturiser, chewing gum and paracetamol. The first is for tackling dry skin from long-haul flights. The second is to take away any bad tastes when you're unable to clean your teeth. Finally, flights can really get to the head, so pack a painkillker. For long journeys you should always have a small packet of toiletries to hand in your bag. Avoid wandering around aimlessly at airports or railway stations. That's easy if you have access to a lounge, but even then the temptation to be restless can get the better of you. Find a place with a view of a departures board, settle down and focus on doing something. The above doesn't mean stay still the whole time! You should stretch your legs and always keep your posture in mind. But avoid going wandering when you take a break. Set a realistic work target for the journey, e.g. you'll finish the book you're reading or draft the outline of a paper. Avoid drifting between tasks. Always take the opportunity to use a power socket to recharge electronic devices or keep them charged when working on them. Download some white noise tracks to help drown out background noise. I also have an iTunes playlist I put together of loud classical music to listen to when working on the move. I'm a big fan of one of Alan Whicker's pieces of advice for travelling: always leave time for a coffee. Travel should not all be rush, work, rush, work, rush, work. I usually grab a coffee before settling down to work. If possible, I'll stay and work in the cafe/restaurant. Have audio books or podcasts to listen to for those times when you can't read a book or work on your laptop. There's nothing worse than standing around, usually in a queue (e.g. at passport control), with nothing to do. Keep it light. I've been trying to work on my iPad instead of my laptop. It's smaller, more portable and easier to work with in the often confined spaces I find myself in on flights, trains and buses. Ensure you've downloaded and can access the documents you want to work on. Don't assume wifi will be available or reliable. Keep one credit card in your hand luggage and separate from your wallet. Helps if your wallet is lost or stolen. When flying: drink lots of water, enjoy some alcohol but only when eating and keep it moderate, set and stick to a time to watch a film (usually when eating), and on long-haul flights you must make time for sleep. On a plane, food can end up everywhere if you hit turbulence. Use a napkin to protect you! And be careful when opening a carbonated drink. A plane bumps around, and there's nothing worse than spraying yourself and nearby passengers with your carbonated drink. When working on a train be sure to keep your luggage in sight. Always have an escape plan. Always know where the exits are. On a plane, count the rows to your nearest exit. If something happens and visibility becomes a problem, you'll now know how many rows you need to to climb over or pass to get to the exit. Whenever possible go with an airline or travel provider you like and book a seat that you'll be comfortable working at. It's not always advisable to fly the cheapest ticket you could find. Join one airline loyalty programme in each of the three major alliances (Star Alliance, One World, SkyTeam) and always use your membership number when booking. It's not just for the airmiles (you should, if possible focus on one airline or alliance for them), but to give you an edge if it comes to being upgraded, not kicked off the flight etc. Chose your seat wisely. According to most surveys, 6A is the golden seat on a plane. And I'd certainly go for an A, which is a window seat and generally more private. 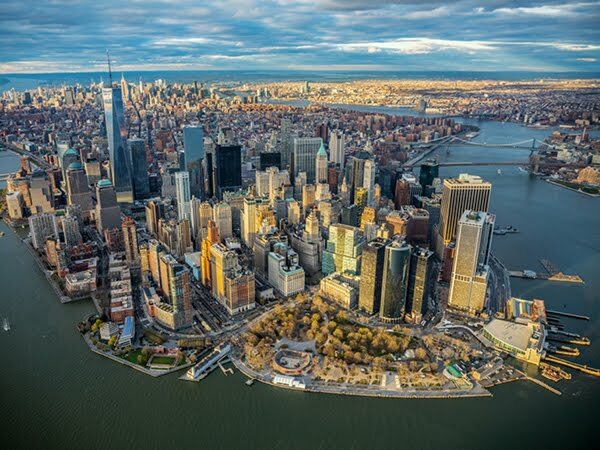 One of the best things about flying is the view, so enjoy it. If you're only staying for a night or two, then avoid using drawers in a hotel room. Keep your stuff in one place. Simpler for repacking and helps prevent you leaving stuff behind. For long-haul flights, when you get on a flight, set your watch to the time of your destination. 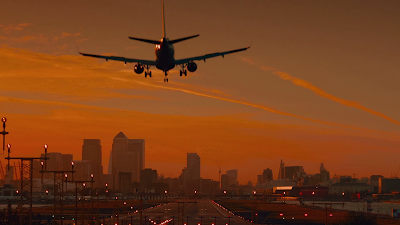 Helps you mentally adjust and think about your plans for what to do and when on the flight. Get some sunlight and fresh air as often as you can. If you're having to fly economy long-haul then have a good meal at the airport. Economy airline food can vary, even within companies. Generally, however, it's awful. Be polite, well-mannered, educated and considerate. Airports can be stressful for even the most seasoned traveller. If you do find yourself stuck behind the disorganised, chaotic family at security then being ignorant and obnoxious isn't going to get you far. If there is a problem then make yourself heard, but be polite and friendly. If something's not right then address it ASAP. Security clearing: we all know it will happen, so prepare in advance. Put your watch, money, keys and anything else into a pocket in your jacket or bag before you get to the scanner. Have your laptop and iPad in an accessible place. Everyone should know the rules on liquids by now. If possible, avoid lanes with families or the elderly in them. Once your trays have passed through the scanner, don't stand around at the conveyer belt sorting out your belongings. Collect your trays and sort your stuff out at one of the nearby tables. Buy a decent bag for travelling with. Ensure that any small suitcase you buy has a small compartment on the outside that you can access without much trouble. Packing light is never easy. General rule for me if travelling for more than 2 nights: a blue suit that travels well, light grey trousers, a pair of decent dark jeans, another jacket (usually a tweed one), a mix of coloured non-iron shirts (I usually go with Charles Tyrwhitt), knitted ties (they're timeless and travel well), polo shirt, a t-shirt/other top, jumper (depending on weather), 1 x gym kit (with shorts that can also be used to swim in) packed inside trainers. The only thing I'm still working on finding are a pair of boots that work formally and informally and so remove the need for packing a pair of Oxfords or brogues. Unless you're at the front of the plane, don't be one of those people who rushes to stand up as soon as the plane has arrived at its gate. All you're going to do is spend a few minutes awkwardly standing around in the aisle. When it's time to board the plane, if you're not eligible for priority boarding, are on your own and are carrying only a small bag then there really is no point rushing up to stand in a queue to board as soon as possible. If you wait until the queue is almost at an end you're likely to be able to stroll onto the plane where you can then put your bag under the seat in front of you. Finally, if flying in economy then don't recline your seat without checking the situation behind you. I know this is a controversial issue, with it starting rows and even fights on planes. Planes are confined spaces, and obviously its worse in economy. I think it's ok to recline only when the row behind you is an exit row, the seat behind you is empty, the person behind you has reclined and gone to sleep on a long-haul flight, or sometimes if the seat is occupied by a small child (but keep in mind the parents might need to move around). A very brief video about tracking down, photographing and uploading onto my Instagram the various Dante Plaques to be found around Florence. 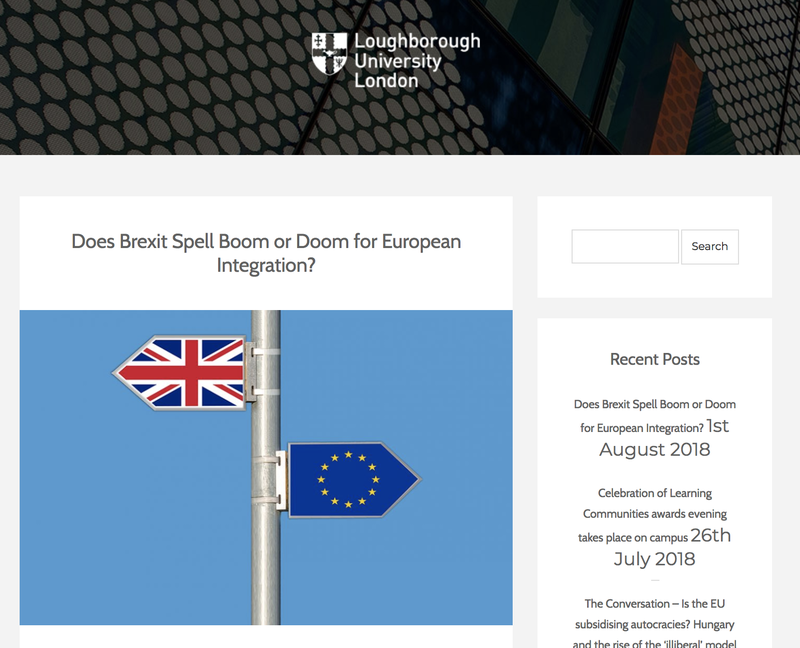 For my first day at the Institute for Diplomacy and International Governance at Loughborough University London I return to a familiar theme in my research: what might Brexit mean for the future of Europe. 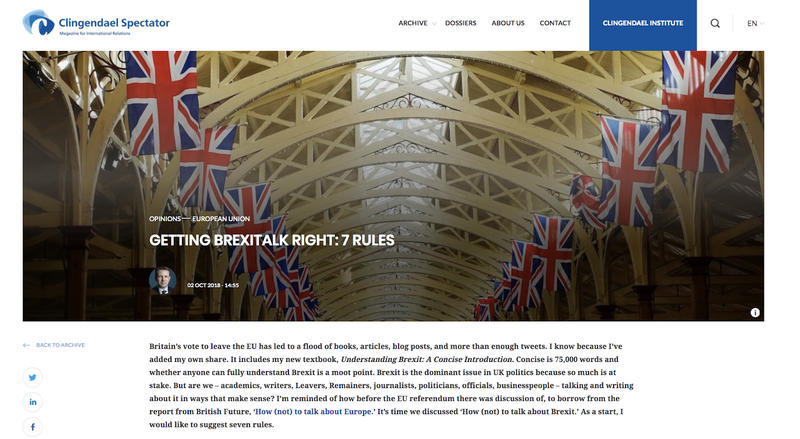 The blog post is a summary of the report I edited for the European Parliament's Committee on Constitutional Affairs.